Welcome to the publications page. Here you will find a list of my personal works that have been published in print. This page will be updated as needed and more works are released in due time. These are listed in order of publication, with a brief summary of work as well as a link as to where a copy can be acquired. Summary: This anthology gives a unique perspective on the modern pagan movement, focusing on the experiences of men within what is commonly seen as a female centric sphere. In the publishers own words, ‘Listen to the words of the Great Mother in the stories of these great men. 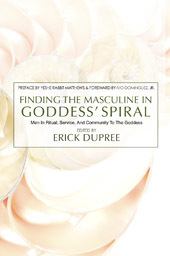 Finding the Masculine In Goddess’ Spiral, empowers the rich dialogue that men have been having about their sacred experiences with the Divine Feminine’. My own contribution, ‘At the Crossroads of Eternity’, focuses on my initial meeting with both Lucifer and an entity I would later learn was Hecate herself. The essay goes on to detail the importance of direct spiritual experience within the great work, and explain how a balance when integrating both the animus and anima is essential to the evolution of the soul.